In this article I’ll examine how to trade areas of support and resistance. We’ll look at how to use reinforcement signals to help predict market direction and avoid the blight of failed breakouts. 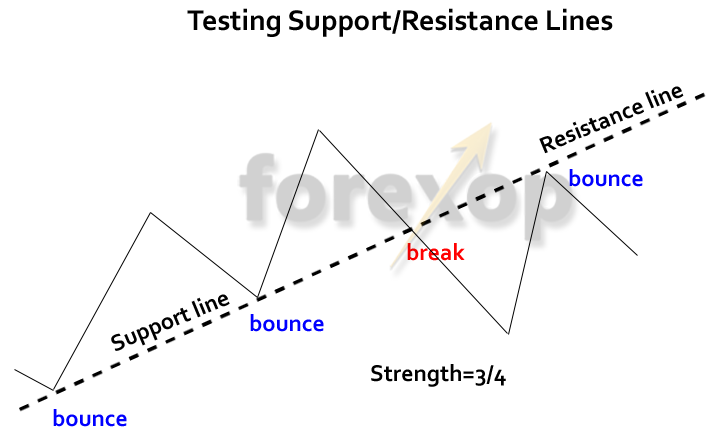 What is a support/resistance line? A support or resistance line is where the price is at a temporary equilibrium and is balanced between buyers and sellers. In other words it’s a point of “possible” reversal. The word “possible” is the key. Support and resistance lines can be transitory and fluid. While they might seem deceptively simple, the market never plays out in the same way twice. So when trading with real money they should certainly be used in conjunction with other confirming signals. So what are these reinforcement signals and how do we identify them to more effectively trade support/resistance? There are three common price actions that happen at support and resistance. These are 1) price testing, 2) fake outs, and 3) breakouts. Figure 1 above shows an example of these three cases. Before you begin analyzing price behavior you’ll need to identify any current support and resistance lines. Then estimate how these will impact the price in the future. The market rarely obeys the exact position of a “price barrier”. For this reason it helps to use a narrow moving average filter (1-5) to mark “a zone” where support or resistance is developing. This helps smooth some of the volatility and more clearly identify a “best fit” line on the chart. For an introduction see this tutorial. When the price pauses at a support-resistance barrier it’s a sign that the market is undecided. Bulls and bears are evenly balanced. The price will test the line with tentative movements. Traders are waiting to see on which side the strength will develop. At this time there’s a lack of conviction. A sudden price move at this point can induce either a rebound away or a penetration through the barrier. In this situation, wait for a reinforcement signal that shows the market’s preferred direction. Figure 2 shows the market testing a resistance line. Notice how momentum slows as the price “bounces against” the resistance. Finally a long bearish engulfing candle appears just after a tentative break. This signifies a “last gasp” where the bulls tried to push up past the resistance line but didn’t manage to gain enough force to carry the move upwards. The next few candles reveal the strength is now on the bearish side and the market plunges rapidly. This bearish engulfing candle was the confirming signal here that likely triggered a cascade of sell orders. Waiting for a confirming signal will lose a few points on the trade but it’s better than calling the wrong direction. A failed breakout or “fake out” is where the price breaks a barrier for short time and then returns back above or below it. Notice that failed breaks are seldom clean. The price usually tests the line a few times moving both up and down. These are called retests (more here). Committing at this point is a 50:50 bet. It’s better to wait until a direction is clear. Figure 3 shows a close up of the price action (from Fig. 1 above) as it approaches the support area. Notice on the first attempt the break is momentary. It then resumes upwards. By the second retests the bearish momentum has slowed significantly. Failed breaks are usually, but not always, accompanied by waning momentum. But once the price breaks a support or resistance barrier it will usually be with rising momentum and with some validation from other signals. Figure 4 shows a zoomed view of the break of the support line from Figure 1. The first stage follows the same pattern as the false breakout. However just before the real breakout, a powerful bearish engulfing candle forms. Momentum turns sharply downwards. At this point the market has enough drive to easily break down through the support. We then see a sharp fall as the price breaks clear of the range. Again, the triggering signal here was a very clear bearish engulfing candle. 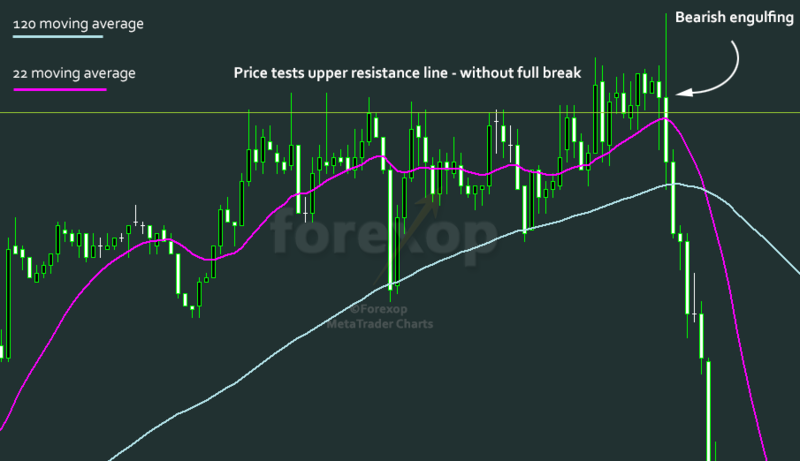 Support and resistance lines can be highly subjective. For this reason it helps to have some objective metrics to gauge their strength. For example, in Figure 5 the price bounced three out of four times, so the strength is 3/4. Recency: Support and resistance lines can span long periods on a chart. We usually give more recent price interactions a higher weighting than activity further in the past. Stoppage: A support or resistance that reverses a fast trend is considered stronger than one that only reverses a slow trend. Duration: The duration of a support or resistance line will of course be relative to the chart time frame. Though, stability over time is important. A line that’s maintained support/resistance on the weekly chart is more significant than one on the minute chart for example. Horizontal levels: The simplest kind of support or resistance is a fixed horizontal line. For currencies this can be a trading range or absolute price. For example you may hear traders say the euro has found a floor at 1.10 or a ceiling at 1.14. This means 1.10 is a support for EUR/USD and 1.14 is a resistance. Pivot lines: Pivot lines are calculated from the previous day’s trading range. The idea is that market dynamics create levels where the price is likely to meet resistance or support and therefore reverse back on itself. Whether pivot lines actually lead or follow markets is not clear. 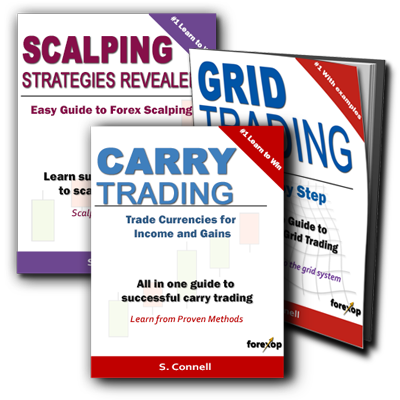 Some traders use them while others don’t. You can make your own mind up by downloading our pivot calculator. Round numbers: Round number do evidently produce some support and resistance. This is probably because people are more inclined to place order stop losses and take profits at rounded numbers. It’s more likely for someone to set a stop loss at 1.10 than at some arbitary number like 1.1038. Therefore bunches of orders can hit the market at these price levels. See Figure 6. Overall, round number support/resistance is probably more important for stock trading where the price is usually ratcheting in a certain direction. Here, barriers like $30, $50, $100 have some news appeal – but this effect is difficult to monitor following stock splits and other adjustments. Currencies trade in narrow ranges to several decimal places so the round number effect is probably less important than it is for stocks. Ratio lines: Technical traders have long relied on ratios to predict reversals. Gann angles and Fibonacci are two popular methods. Fibonacci ratios work both on the price and time axis and trace out reversal lines and extend them into the future. Gann angles and Fibonacci fan work in a similar way. They project ratio lines out from the top and bottom of the move. This is shown at A and B in Figure 7. The extended lines predict future support and resistance (ahead of point B). Gann theory also suggests a fifty percent retracement rule where the price should retrace fifty percent of the original move before meeting support or resistance. You can look at any chart and find examples where these ratios do indeed work. Unfortunately though there are as many examples where they don’t. Trend channels: Even the strongest trends have some oscillation where the market rallies then pulls back. Figure 1 shows a good example of this. The channel in which price movement takes place provides areas of support and resistance. Technical traders say the trend is broken when a lower or upper resistance within the channel has failed to hold. In this case, the trend is presumed to have reversed when new highs/lows fail to break the upper or lower watermark that the trend has made. For example in Figure 1 you can see the trend starting to weaken about two thirds along where it fails to break new highs. Eventually it proceeds to break the lower channel support. Psychological barriers: These are big figure numbers for example EUR/USD breaking 1.0 (parity) or GBP/USD breaking 2.0. Of course there’s nothing special about these figures. Nevertheless as I said above, it’s best to be attentive because order volume and volatility will usually increase around these levels. See the support resistance indicator. I am trying the indicator but can you explain how to set it to alert me when it breaks any one of the lines. Do you use the strength value which displays on the chart or you trade on any line? In the inputs box there’s a setting called alerts. Just set that as needed. You will need to set a distance in points as well for the alerts to trigger properly. Set to a bigger value to receive more alerts. If it’s a low number you would only get notified when the price is very close.